What Ever Happened to the System Tray? The System Tray is now officially known as the “Notification Area”. But to all of us who’ve been around Windows for a long time, it’s still the “System Tray” to us. 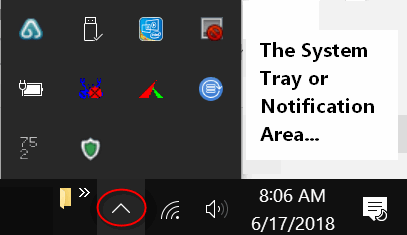 Whether you call it the System Tray or the Notification Area, it’s that part of the taskbar which shows your clock and icons of programs / services running in the background. Above you can see the System Tray / Notification Area on Windows 10. If you have a lot of icons in your System Tray, that’s a pretty good indication that you have too many programs starting Windows. Windows 10 makes it pretty easy to control the System Tray / Notification Area. Just right-click on an empty area of your taskbar and click “Taskbar settings”. 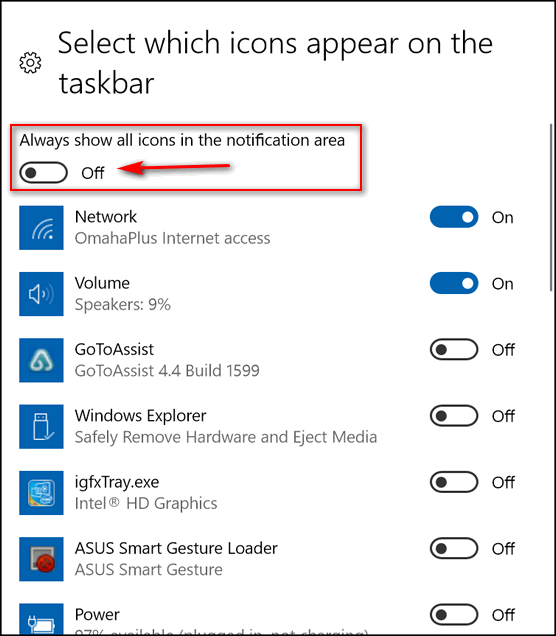 In Taskbar settings, scroll down to “Notification area” . Now click on “Select which icons appear on the taskbar” (but they really mean “Notification Area/System Tray). The switch at the top “Always show all icons in the notification area” should be turned off; if it is not, you’re going to have a mess. You can turn individual icons on/off here. If you have particular icons you want to show – or do not want to show – in the System Tray / Notification Area, this is where you need to be. If you want to turn System icons on or off (like Network, Clock, Power, etc.) 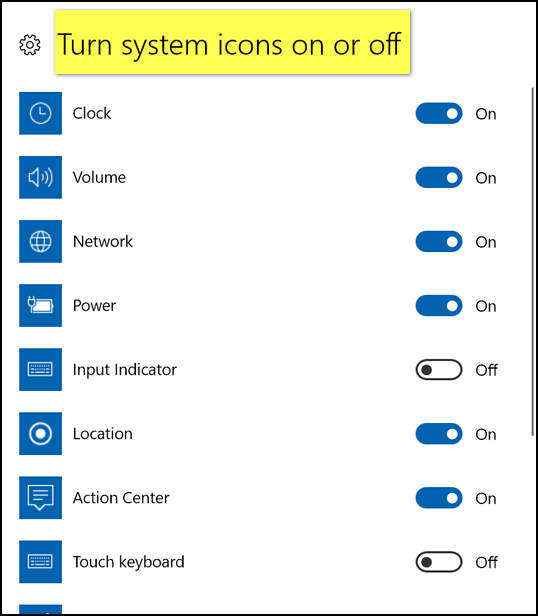 go back to Taskbar > Notification area and click “Turn system icons on or off”. Above you can turn off or turn on any system icon you want to show in the System Tray / Notification area. If you don’t really care what time it is, turn off the clock. But who would turn off the clock? So, whether you call it the System Tray or the Notification Area, it’s all the same. 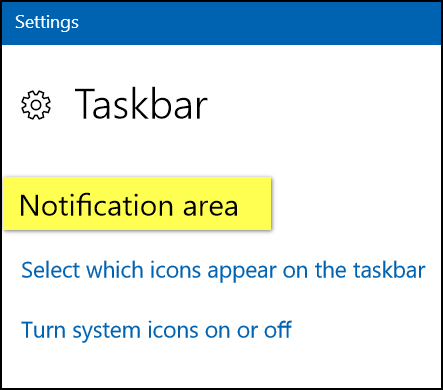 And now you know how to control your System Tray / Notification Area if you’re using Windows 10. If Microsoft employees were let loose to produce motor vehicles (no way Louie) the steering wheel would become the Control Device, the brake the Speed Reduction Unit, the accelerator the Active Movement Control, the engine the Operation Creator and the gear shift the Process Controller. There must be some mental deficiency in the minds of the current Microsoft employees, in simple terms, “It Wasn’t Broke, Stupid Change Of Descriptions Made The 10 O/S More Useless.